Previously we heard the news of a Takara reissue of a screen accurate redeco of the sword which came with AD31 Armor Knight Optimus Prime. 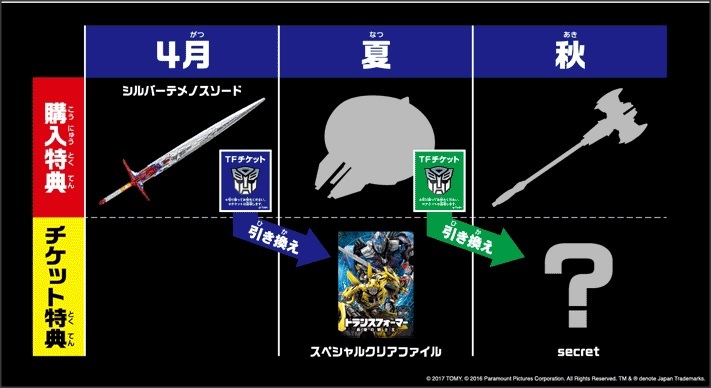 Today, we received info of an extension of this campaign which will include a reissue of the shield which came with the aforementioned figure as well as Optimus Prime’s axe from Transformers: Dark Of The Moon. The shield will be released in summer and the axe in fall. There will also be a secret prize included. Check out the promo image, after the jump. Suh-weet! I'm in for all these accessories! Was already posted in the other thread a couple of days ago. Yes, but it was only about the Temenos Sword, here we have information of more items for the campaign.